The bar decorating continues with more updates to these rustic bar stools a friend found on Craigslist. 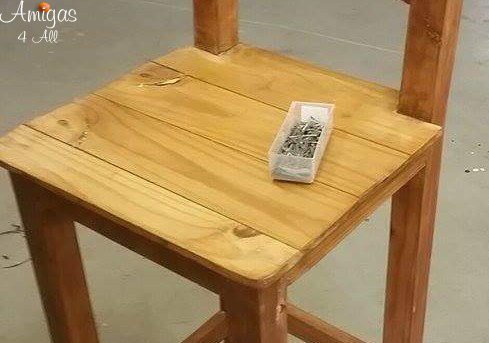 I showed you in part 2 what I did to bring these bar stools back to life by cleaning them up and staining them in a light color just to give them some “hydration”. Today, I will show you how I made my bar stools more comfy and how added stenciled letters to give them some personality! Follow me in this new and exciting chapter of my bar decorating saga (it all started with the first chapter with my bar decorating post). Now that the bar stools were breathing again, I decided to hide some of the imperfections I mentioned on part Deux like the warped seat for example (see below). To do that I decided that cushions would do the trick. I could also tell that these chairs were pretty hard to sit for a long time. We all know that if the game is on it can take a long, looong time to end (yes, the hubs complained also about the hard seats!). So, I figured I needed to make them a little more comfy. At first, I thought about buying “ready made” cushions from my usual “decorating on a budget stores”. I reaaally wanted these cushions I found on Amazon. They were comfy and the right color. And I could still personalize them. Unfortunately, my bar stools were too weird of a size and nothing fit. Sniff! The seats are pretty wide and all the cushions I found for purchase were two inches too short in every direction. I thought if I used smaller cushions they would look goofy. So buying was out and I was going to make the cushions myself. When I decided to make cushions I realized that making individual removable cushions would take too much fabric because of the size of the seats. The easiest and cheapest way to do this was to just upholster the seat instead. Since I wanted to give it a rustic look I thought burlap would do the trick. Burlap is cheap and very versatile (You can get a good quality burlap here for a fraction of the cost). The other thing I wanted to do was personalize it and make it look like old coffee bags. Let’s get this party started! I started with foam cut to size. (notice I had to add more foam to make it the size of the chair-I used what I had a home). Then I cut the burlap with enough material left to cover the foam on the top, sides and under. Once the burlap was lined up, I stapled it to the underside of the chair. Be careful with the corners! They can be a little tricky to fold and staple. But if you are old school like me I am sure you covered your school books with paper to protect them. So you will know what to do with the corners. Or if you never did that you can just fold them carefully like an envelope or a “V”. Staple them firmly so they don’t pop out or look bunched up. It’s not the best picture but you get the idea. So now that all 4 chairs are “burlapped TM”, it was time to give them a little more personality. Since I used new burlap I needed to make them look a little more “used”. Or better yet, I wanted them to look like discarded coffee bags! Of course, because us DIYers fell in love with the whole rustic “everything” these coffee bags have gone up in price. A lot! I have seen coffee bags as high as $50 a piece!! Luckily if you go to Amazon they have a good selection of decently priced coffee bags for you. Unfortunately, because of my weirdly sized chairs, I needed everything custom sized. So I had to make my own “faux” coffee bags. It’s all right. I like a challenge like that anyway. As for the colors, since I’m going for the coffee bag look I thought I would use blacks, blues, reds and greens. Make sure when you paint that you grab just a little bit of paint first with your sponge. Then use a plastic lid or another surface to tap on your sponge before applying it on to the stencil. You can use ready made stencils or even print letters and other designs online. You can also create your own stencil. It all depends on the look you want and if you have the time to cut each letter (that’s a lot of work!). Wrapping it up! Pun Intended! For an extra special touch of Mexican Flair (the theme of my home bar), I wrapped these Mexican scarves to the back of the bar stools (see below). I saw something similar done in a restaurant in Cabo San Lucas (my favorite place in the world!) and I wanted it for my own bar. It was so cool to bring a little piece of paradise into my home! And here are all my “pretties” together, singing in harmony! You can certainly create even more designs and use different style stencils. For my bar I wanted them rustic, “beat-up” and “worn”. I think it’s pretty close. And yes, I know none of them have coffee written on them but you get the idea. Aren’t these chairs the coolest?! I hope you liked them. Join me in the next episode of the bar decorating saga. I will show you how I transformed some run-of the-mill bar stools into more seating for the bar. And without taking too much space. You will use the same concepts we learned today (yes, more stools! and yes, it will be worth it!) . How I Brought My New “Old” Bar Stools Back To Life-Bar Decorating Part Deux! Oh! The “Wild West” home bar of our dreams …but no bar stools to match! As you saw in part 1 of our bar decorating saga (here’s part 1) we managed to get the bar of our dreams in a bargain deal, but when we were looking for the chairs we were shocked to discover how expensive they were, especially if you wanted to use a rustic style. This post contains affiliate links. I may make a commission from any purchases you make through these links without any extra cost to you. This is how I make sure I have enough drill bits for my next project! Some of these bar stools were more expensive than a car!! Who pays $1000 for bar stools? No offense to those who can, but seriously?! My head was going 1000 miles per hour thinking: Who in the world could pay for 5 bar stools if they were that expensive? The price wasn’t bad but I just could not afford 5 of them. So, I looked here, there and everywhere for something similar. How We Found Our Bar Stools!! I engaged the help of my research queen and friend “McGiver” Carol. She lives in a place where there are a lot of Mexican goodies including rustic furniture, just the way I needed. She searched a little bit and wouldn’t you know, she found them! And after a little bit of back and forth, she was able to buy them for $35 each! Guess how much these are brand new? 260 bucks! The bar stools looked perfect in the room (Here are some more pictures). They were only selling 4 stools but we figured out later that 5 bar stools would have looked a little cluttered. Especially when you add two more tables and bar stools around them as I later did (see my posts for table 1 here and table 2 here). The first thing I needed to do was give them a good scrubbing. Once that was done the bar stools were ready to be restored. I mean, ready to be stained. 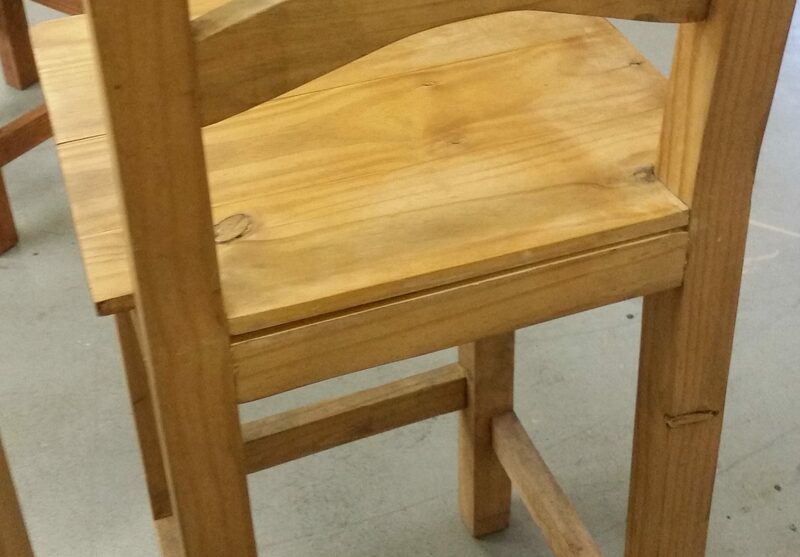 Note that the wooden seat in one of the chairs was deformed and the other was separated. I could have just replaced the wooden seats with a new wood base, but I thought that even if I sanded all the wood around the legs and back, they would never match the rest of the chair no matter how much I tried. I later decided to upholster the seats (here’s how I did it). But before that, I started by nailing the warped seat to level it a little. Even if the seat was not perfectly level the foam and fabric would certainly hide the problem. The other bar stools had other minor imperfections and they were easy to fix. But once the bar stools were stained they would still have some “character” since they would still show that they had a previous life somewhere. In other words, they would not be the cookie cutter stuff you find with faux rustic stuff. These were the real deal. Especially because the wood in my bar is completely rustic. It has even wormwood holes in it! The next task was to stain them. I opted for two colors of stain: one to bring life to the wood – Minwax Wood Finish Stain- Color Provincial 211 (a little more yellow). Then Minwax Wood Finish Stain – Color Red Chestnut 232, a more reddish color to change the pale appearance and match at least some points of the wood in my bar (see). So here’s the final product! I know it’s hard to see but these chairs were very dull and ready to crack because of dehydration. Join us for the next step, the upholstery project, and see how simple it is to give life to a stool/chair by simply adding foam and fabric! It is not difficult, and it is super fun to see the final product. And you can tell everyone that you made it yourself! Let us see your project in the comments below! Follow us on Facebook and Pinterest for new project ideas and don’t forget to sign up for our email list below for news and updates!